Appropriately named since it is very light and knits up to a BIG gauge! This Katia yarn is a blend (almost 50/50) of acrylic and wool. While I tend to me a "natural fiber" girl, I see a role for acyrlic blends in a couple of places. Namely with cotton to reduce the density and in big fat chunky yarns, for the same reason. Even wool spun to a big 1-2 sts/inch gauge can be dense, heavy, and feel like armor to wear. So if you want a big chunky gauge with a bit more drape and "softness" for a cowl or scarf, this is a great option. 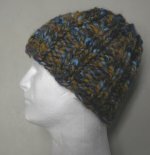 The hat shown below took just 1 skein and the pattern is free with the yarn puchase. Fun, contemporary European color schemes also bring a fun vibe to this yarn. For other 1-2 st/inch yarns check out the listing by gauge.